There are a number of different ways to straighten wire. One way is to hold the wire in one hand and to run the index finger and thumb of your other hand along it until it straightens out. However, this can be tough on your fingers, especially with a thick diameter wire. 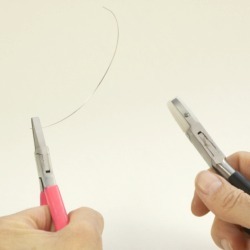 The method I prefer is to straighten the wire using a pair of Nylon Flat Nose Pliers. To use this method, place one end of the wire in a pair of flat nose or chain nose pliers, held in your non-dominant hand. 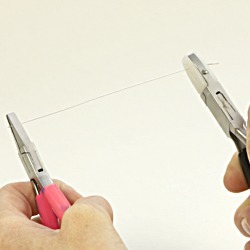 Hold the nylon pliers in your dominant hand and place them on the wire next to the other pair of pliers. 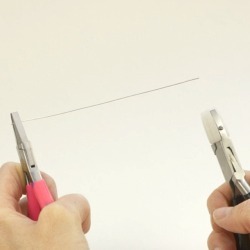 Grip the wire firmly and draw the nylon nose pliers along the wire straightening kinks and bends as you go. Repeat this action several times to get the wire as straight as you need it.